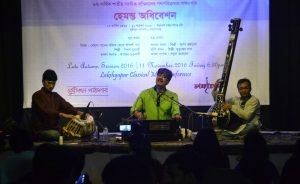 The Late Autumn Session of Lakshyapar Classical Music Conference was held recently in Narayanganj. This is for the 4th time that the reputed private initiative library named Sudhijan Pathagar hosted the programme in its reading hall. The three artiste soiree began in the evening of 11 November Friday at 7’O clock with a very healthy audience of about 200 persons who were heartily welcomed by the Chief Executive of the library Mr. Imtiaz Faruq Moin and the Chief Advisor of Lakshyapar Mr. Kashem Jamal. The performances began then with promising flautist Mrityunjay Das who showed signs of growing maturity in his portrayal of raag Durga which is a very serene evening raag. Mrityunjay Das finished his part with a short kirtan as requested by the audience. The next item was a lecture demonstration on “The Transformation of Bandish from Kheyal to Semi-classical Forms”. Biplab Mukherjee successfully handled the part with Rupayan Chakraborty in Tabla. The last artiste was Sarodiya Arnab Bhattacharya. 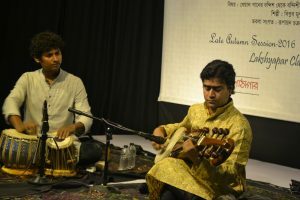 He took raag Jhinjhoti and proceeded gradually through aalap, jorh, jhaala in the first part and then in the next part went into a grand low-tempo composition and wrapped it with a sparkling fast composition. 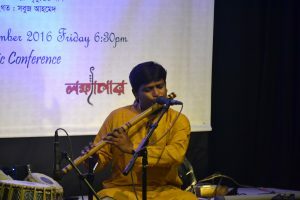 Sabuj Ahmed accompanied in Tabla. In the concluding part Lakshyapar coordinator Asit Kumar thanked local and foreign artistes, the audience and library authority for their response and consistent support. 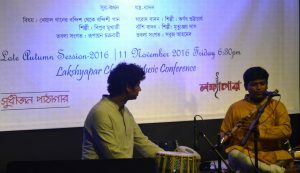 The programme ended with the declaration from Mr. Kumar that the 8th Annual Classical Music Conference of Lakshyapar would be held in January 2017.